The development of stem cell treatments for amyotrophic lateral sclerosis, a disease which causes the death of neurons controlling voluntary muscles, currently suffers from a lack of robust imaging biomarkers that can aid the evaluation of stem cell survival, migration, and localization following transplantation. Of note, one clinical trial has employed superparamagnetic iron oxide nanoparticles as a magnetic resonance imaging (MRI) contrast agent , although sources of contrast arising from magnetic susceptibility effects associated with traumatic injury and/or hemorrhage can complicate the discrimination of transplanted cells . As an alternative technique, perfluorocarbon dual‐modal tracer agents for fluorine‐19 MRI and fluorescence detection have emerged as an efficient, effective, accurate, and safe means to label and track transplanted cells that are currently moving towards clinical application . Indeed, one mouse study has established fluorine‐19‐labeling as an effective means to identify neural stem cells in the mouse striatum employing serial MRI over two weeks post‐transplantation . To push MRI‐based cell tracking via fluorine‐19 cell labeling further towards clinical application, researchers from the laboratory of Nicholas J. Maragakis (Johns Hopkins University, Baltimore, Maryland, USA) sought to demonstrate that this labeling technique does not affect the fundamental neuroprotective properties of human glial‐restricted progenitors in a new STEM CELLS Translational Medicine article . These multipotent therapeutically relevant progenitors can differentiate into astrocytes or oligodendrocytes, but not neurons , and have recently been granted an Investigational New Drug status for intraspinal transplantation in amyotrophic lateral sclerosis patients by the US Food and Drug Administration. Richard et al. 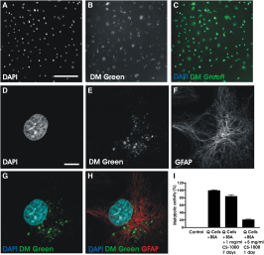 first optimized the concentrations and incubation times employed to load human glial‐restricted progenitors with a commercially available perfluorocarbon probe to ensure that labeling provoked only a minor effect on in vitro glial identity, cell survival, proliferation, and astrocytic differentiation ability while maximizing the fluorine-19 signal. Moving in vivo, labeled human glial‐restricted progenitors retained their ability to integrate into the ventral horn of the spinal cord of a mouse model of amyotrophic lateral sclerosis, where they retained both their labeling (for at least seven days) and their astrocyte differentiation capacity. Finally, the authors highlighted the enormous potential of perfluorocarbon labeling by demonstrating the ability to visualize labeled cells transplanted into the mouse brain by hot spot fluorine-19 MRI. In summary, the authors believe that their new findings will represent a platform for the preclinical development of in vivo perfluorocarbon-based techniques to evaluate human glial‐restricted progenitor transplantation in the brain and spinal cord of large animals and then amyotrophic lateral sclerosis patients. For more on stem cell treatment for amyotrophic lateral sclerosis, the development of human glial‐restricted progenitors as a treatment, and the use of fluorine-19 MRI in stem cell tracking stay tuned to the Stem Cells Portal. Karussis D, Karageorgiou C, Vaknin-Dembinsky A, et al., Safety and immunological effects of mesenchymal stem cell transplantation in patients with multiple sclerosis and amyotrophic lateral sclerosis. Archives of Neurology 2010;67:1187-94. Bulte JWM and Daldrup-Link HE, Clinical Tracking of Cell Transfer and Cell Transplantation: Trials and Tribulations. Radiology 2018;289:604-615. Ruiz-Cabello J, Barnett BP, Bottomley PA, et al., Fluorine (19F) MRS and MRI in biomedicine. NMR in Biomedicine 2011;24:114-29. Ruiz-Cabello J, Walczak P, Kedziorek DA, et al., In vivo "hot spot" MR imaging of neural stem cells using fluorinated nanoparticles. Magnetic Resonance in Medicine 2008;60:1506-11. Richard J-P, Hussain U, Gross S, et al., Perfluorocarbon Labeling of Human Glial-Restricted Progenitors for 19F Magnetic Resonance Imaging. STEM CELLS Translational Medicine 2019;8:355-365. Rao MS and Mayer-Proschel M, Glial-restricted precursors are derived from multipotent neuroepithelial stem cells. Developmental Biology 1997;188:48-63.